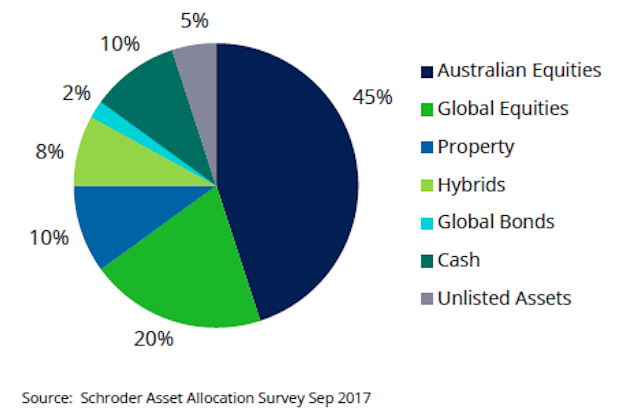 Following the 2017 annual reporting season Schroders has again surveyed Australian brokers to gain insight into their asset allocation views. The inaugural survey six months ago highlighted the top three objectives for participating brokers were to generate income, maximise returns including franking credits, and protect capital. Diversification replaces growth as primary driver. ASX listed stocks dominant; while direct equity and hybrids are the most popular ASX vehicles there was a clear move towards LICs at the expense of direct shares and active ETFs. Asset allocation decisions have picked up at the margin, with 22% changing asset allocation in the preceding six months, up from 14%. Twice as many respondents think increased returns are more likely than decreased returns over the next three years. The March survey showed that ASX listings remain the dominant implementation vehicle of choice and that on average brokers were allocating 80% to growth assets (Australian equity, global equity and A-REITs). This has remained essentially unchanged. Sentiment was positive with limited concern for an equity market correction. In the six months to September, the growth-oriented exposure and lack of concern about a market correction have both proven well founded. Equity markets have delivered positive total returns (+1% in Australia, +10% in global equities (A$ hedged) and -1% in A-REITs). Although not overly represented in broker portfolios, returns from Australian fixed income have also been positive over that time delivering +2.5% returns.